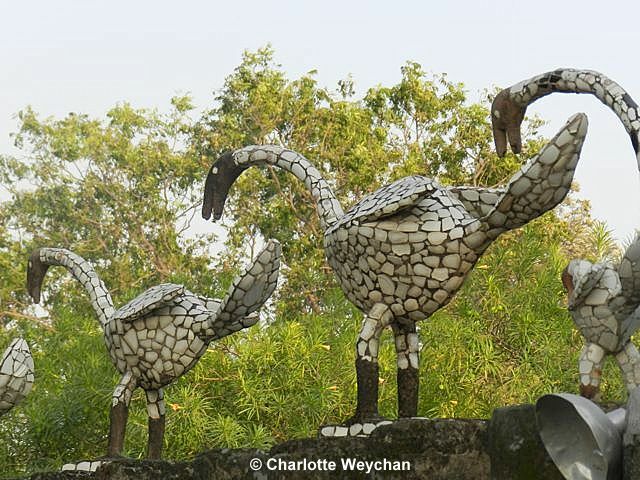 When you arrive at the Rock Garden in Chandigarh, the first tiny taste of what awaits you are the sculpted water birds adorning the entrance wall (above). 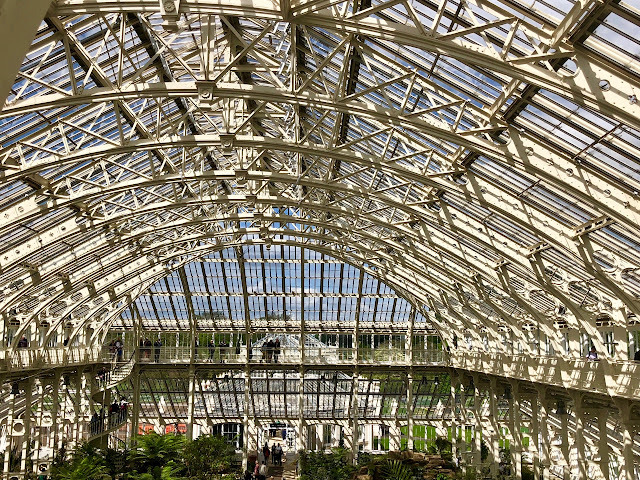 Arrive on a Sunday as I did and you will queue for an hour to get in, because the garden has become as popular with locals as tourists, but visit on a weekday and there is hardly anybody there. Nek Chand started creating this magical kingdom over 60 years ago, just as Chandigarh was under construction. He has worked here ever since, and now aged 86, he continues to visit every day, and is completely unaffected by his international celebrity status. 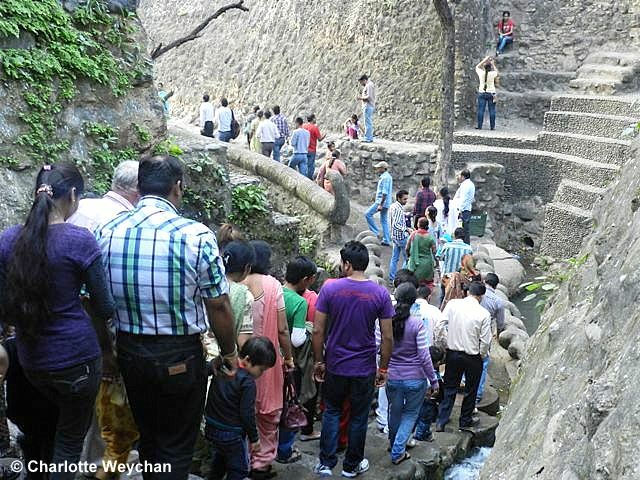 Nek Chand arrived in Chandigarh in 1951 - he was just 27 years old, newly married and, like many of his fellow countrymen, still reeling from the after shock of Partition in India. The ultra-modern city, designed by Le Corbusier, was under construction and was symbolic of change in a country that was shaking itself free of British Imperialism. Chand studied the maps of the new city and realised there was a thickly-forested tract of land between Sukhana Lake and the high court building that was not scheduled for reconstruction. He had already started collecting fossilised rocks from the Kaushalya riverbed and he brought them here to his secret place; built himself a shelter where he slept at night; built fires of rubber tyres to ward off the snakes; and over the next 20 years created the magical kingdom that exists today. He cleared the land; built the temples, buildings and walkways; planted additional trees; and created the thousands of sculpted people and animals that make the garden so unique. 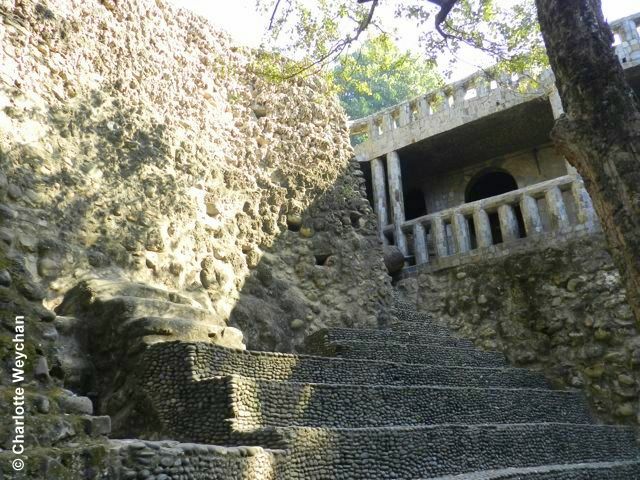 All went well until the mid-seventies, when an official discovered what was going on within the walls of Nek Chand's secret garden and, as he didn't own the land, he faced the possibility of eviction. But worse was the threat that his life's work might be destroyed. It looked as though all would be lost until Chief Commissioner, Dr M.S. Randhawa arrived to inspect the site. 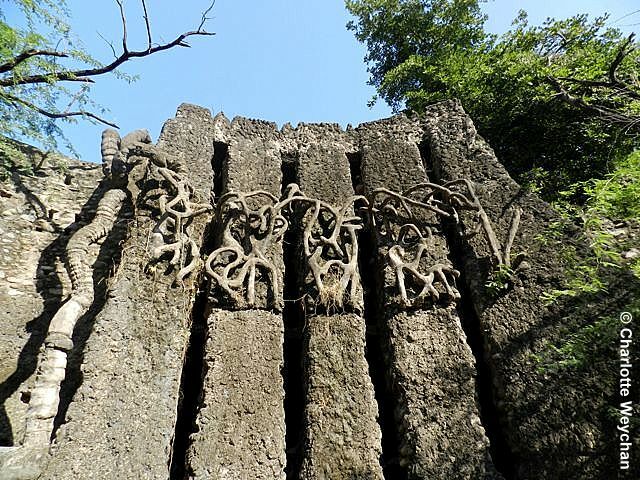 And, as luck (or maybe fate) would have it, he was an art lover who immediately recognised the extraordinary feat that Nek Chand had achieved in creating this garden out of nothing except natural materials and reclaimed rubbish. Randhawa elected to champion the cause and provide Chand with a gang of workers and transport, so he could carry on with his work. 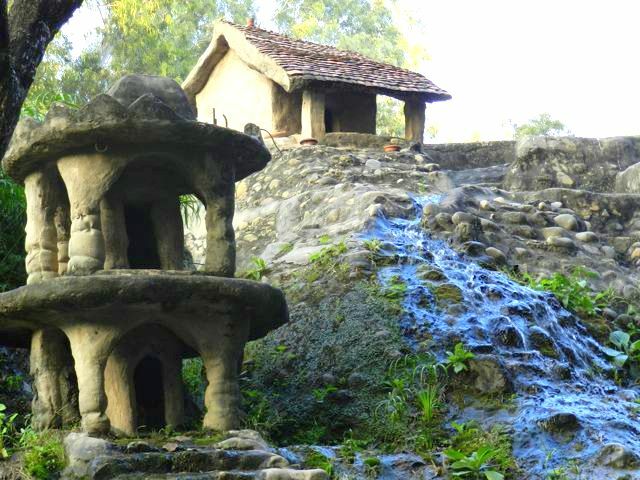 The rest of the story is history and in the last 30 years, Nek Chand has continued to develop his life's work; been visited by international celebrities and politicians; and placed the city of Chandigarh even more firmly on the tourist map. Keep looking up to appreciate Nek Chand's architectural skills! 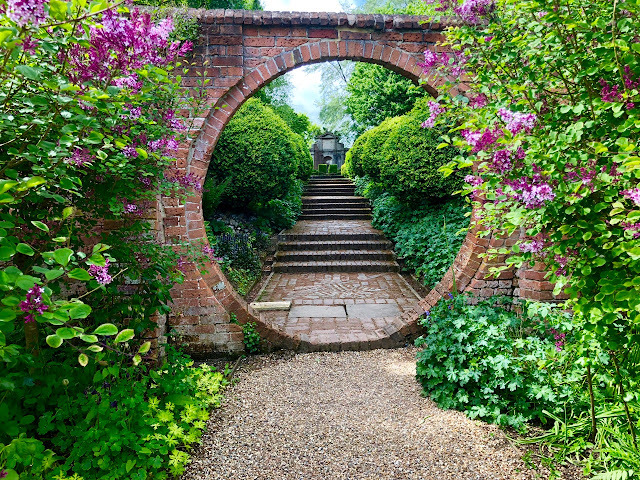 Visit at a weekend and you will be overwhelmed by the number of local tourists (above) - every inch of this 30-acre garden is filled with chattering people who are truly amazed by the garden. The narrow pathways are overflowing with visitors, who stop and marvel every few seconds, as another extraordinary feature catches their eye. 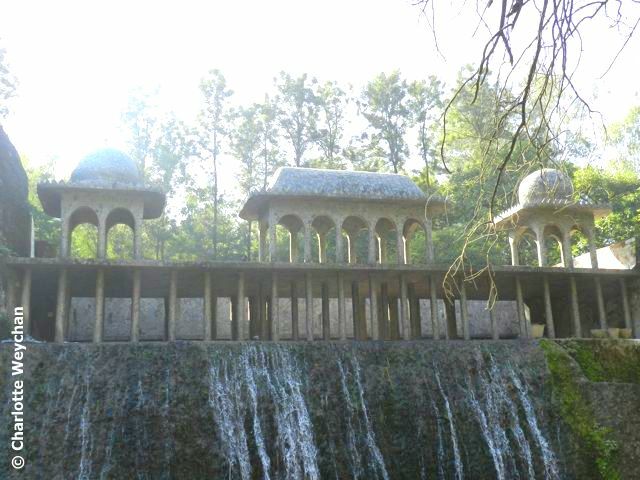 The first part of the garden is an architectural wonder, with canyons towering above; topped with temple-like structures and water flowing freely down rock faces. Every wall is different, every surface constructed using domestic waste, like the socket wall (above left) or carefully crafted pebble designs, designed to appeal to the eye. 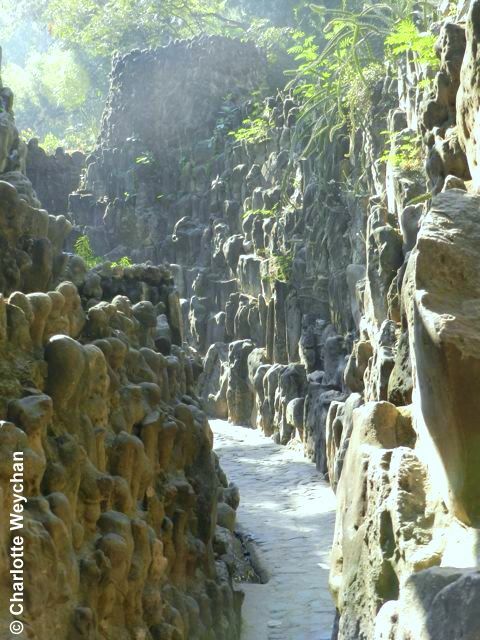 And then there are the great gorges (below), where you must look up to appreciate Nek Chand's carefully-crafted facades and tall bridges that draw your eye down the garden. This place is a masterpiece - and for me, ranks alongside the Taj Mahal in terms of India's wonders! 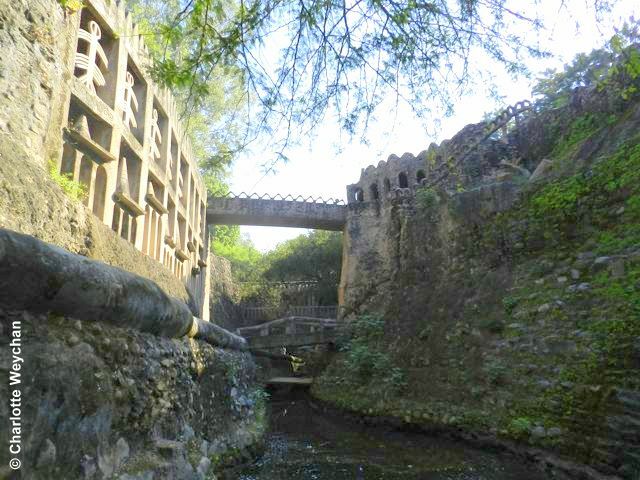 The reality is that Nek Chand constructed everything you see and designed an ingenious method of storing water in tanks so that the water would keep flowing, even in the dry season. You need to look up as well as around, in case you miss something, and occasionally, you'll see figures peering down at you - either sculpted or real, because the garden curators watch from above to make sure that nobody damages this great work of art. Many of the walls are built of coarse local rock, but then Chand has embellished the open spaces with bridges and constructed midget-sized doors high in the rock faces. Monty Don featured this garden in his television series, "Around the World in 80 Gardens" - but it had already gained international repute long before this. 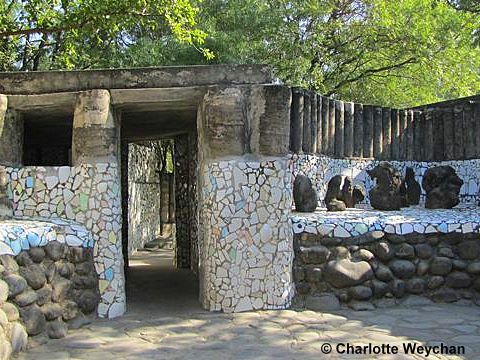 Visit Nek Chand in his office and you will see pictures of him with Indian Prime Ministers and many other foreign politicians, as well as internationally-acclaimed film stars and musicians. But the fact remains that Nek Chand is a simple man - he has charm, talent and integrity and has not allowed his success to go to his head. I sat and took tea with him and was honoured to be in his presence. And words will never do justice to the amazing garden he has created! 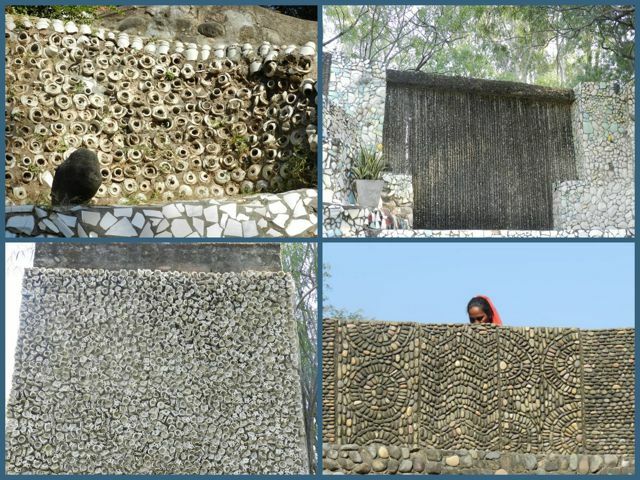 For more pictures of the Rock Garden, click on the link. In my next feature, I will be looking at some of the amazing figures created by Nek Chand, during his sixty-year reign here. Thank you so much for posting this fantastic garden. I thought I had left a post earlier but see that I didn't. This is a garden DH and I would love to visit. Truly a work or art and love. What a cool looking place!!! I'd love to visit this place!! Wow, these sculptures are so spectacular! I look forward to each new post about this amazing place. and talented man. What a find, and fun time to explore it. Thank you for the tour of this enchanting and magical garden Charlotte. I would have liked a little more planting...just to soften the edges..